Tonight in Toronto, Koerner Hall will be the site of a performance of Jewish Folks Telling Jokes, a night of comedy to benefit Jewish Family and Child, one of the foremost Jewish service agencies in North America. Jewish Family and Child supports the healthy development of individuals, children, families, and communities through prevention, protection, counselling, education and advocacy services, within the context of Jewish values. Judging from the promotional video for the event, Jewish Family and Child will also be supporting lots of laughter. Check out the video below for a sample of what the evening will bring. It's a string of old Jewish jokes told in rapid succession that should bring down the house. 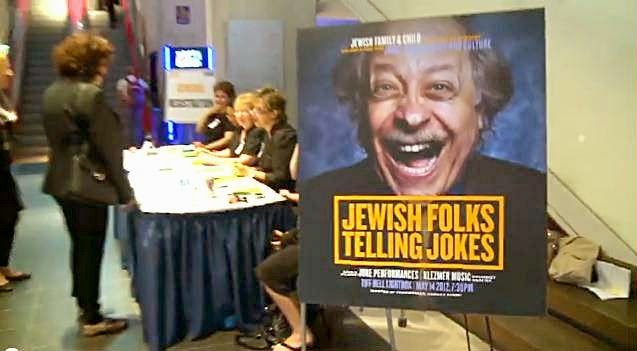 Jewish Folks Telling Jokes is a Canadian contribution to the world of Jewish humor, probably inspired by the off-Broadway show Old Jews Telling Jokes, now touring in San Diego, California. I can't hear this one. Lately, I've not been getting any sound on your daily materials.